For twenty-five years, beginning in 1961, Mr. Hampe was a teacher of history, math and English at St. Helena High School. For five of those twenty-five years, he was also principal. Mr. Hampe left teaching in 1985 to work in public relations at Sutter Home Winery and eventually became the director of public affairs. It was during the ten or so years in that role that he became very active in community affairs in Napa County. He was on the County Mental Health Board for eight years, two as chairman. 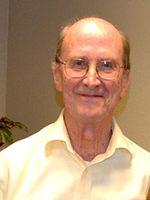 He has been active in childcare issues for over fifteen years and was in charge of childcare at Sutter Home. He is now a member and chair of the Napa County Child Care Planning Council. For about six years Mr. Hampe has been a member of the board of Napa Valley Support Services where he serves as vice president. In addition, he has been active in state and local political issues, education and the chambers of commerce. He was chair of the Yes on Proposition L Committee supporting migrant farm worker housing. Mr. Hampe and his wife Wheyting have been married for 49 years and have two children, Carl, 43, who is an attorney in Washington, D.C., and Carrie, 40, who works at North Bay Regional Center. Carrie suffers from epilepsy and as such is a client of North Bay Regional Center and Napa Valley Support services. We have lived in the Napa Valley since 1961.